Jeff Shulman, editor of Card Player magazine, remarked in 2004 upon a conversation he'd participated in regarding four-color decks. As it happened, the decks under discussion were all virtual decks; that is, decks of playing cards used on various online poker sites. Mr. Shulman wondered: "Is poker big enough now to change the standard black and red deck to black, red, green, and blue? Even though the idea was laughed at years ago, it may be time to change." It makes sense that online poker players might prefer the four color deck, for the simple reason that they are looking at images of playing cards on a computer screen where visibility may or may not be ideal. Additionally, online poker games move very fast, much quicker than home games or games in casinos. Given these considerations, one would not wish to take a chance in misreading a card, perhaps mistakenly thinking one has hit a flush. Four color decks do exist in the real world. Carta Mundi used to manufacture a four-color deck, called Spectrum "No Revoke" Playing Cards. These were available with black or white backgrounds on the reverse side, and used to be distributed in the USA by US Games. 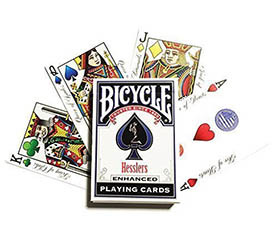 Although the Spectrum cards are no longer available, Bicycle does offer a four color deck called Hesslers, which is shown above. The cards are attractive, stand out, and are definitely collectible. We've also seen standard and low-vision four-color decks offered by a company called Cornucopia Brands. There are Bicycle E-Z See Special Playing Cards, pictured left. Finally, if durability is an issue, the reader may wish to take a look at Copag 4 Color 100% Plastic Playing Cards, offered in a 2-deck set and poker-sized. As one can see, there are many options available to today's card player. For four color decks, the time has apparently arrived.